I keep hearing talk about a new trend in boys names and I wanted to do some research to see if this is a real thing yet or not. Apparently the new favorite thing is boys names that end with the letter -o. Some examples that I keep hearing about are Hugo, Arlo, Milo, and Leo. Now, when I went through the Top 500 names of 2012, I found so many more names ending in -o than I imagined that I would. However, the Top 100 was very absent of a single -o name. It wasn't until I hit #110 that I found my first, Diego. In all, there were 37 names between #110-500. As a woman of Hispanic heritage, I have to imagine that most of these -o names are legitimately used by Spanish and Italian families. It leaves me wondering how many of these are truly gaining popularity across the race spectrum, and how many have always lingered around their respective ranks. I have no way of looking up the race of the parents, but I had to dig deeper to see which of these are climbing the charts and which are reliably stable. 1. Romeo (#323): Climbed 38 spots! 2. Leo (#134) and Mateo (#138) tied for 2nd. Both jumped 33 spots! 3. Milo (#330) Shot up 30 spots! 4. Gustavo (#408) Climbed a surprising 29 spots! 1. Fernando (#243) Fell 34 spots! 2. Mario (#253) and Maximiliano (#320) Both dropped 30 spots! 3. Mauricio (#472) Fell 28 spots! 4. Matteo (#412) and Arturo (#459) Both fell 27 spots! Absent in 2010, Arlo placed at #916 in 2011 before jumping a whopping 98 ranks to settle at #818 in 2012. This is one to watch! Leo and Mateo seem to be gaining popularity. Both climbed 33 spots last year, but I think they'll continue to climb the ranks and quiet possible break into the top 100 in the next couple years. Thiago is an interesting one. Its counterpart Santiago moved up 9 spots to sit at #122 in 2012; however Thiago has just burst onto the scene for the very first time, landing at #862 in 2012. I'd like to keep an eye on this one. 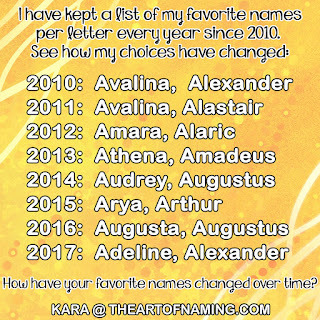 Lastly, Hugo gets thrown around the baby name forums regularly so it may seem more popular than it actually is, but I'll include it on the list despite only climbing 3 spots from 2011 to 2012. Hugo rests at #436 for now. That is my assessment of the -o name trend for boys. This is one trend that I can get behind, especially considering how tiring the -n names are becoming. What do you think of my list? What is your favorite boy name ending with -o? Let me know in the comments below!